Orange’s Kailee O’Brien (5) works to get around Centennial’s Rhian Jones during the first half of Friday’s non-league showdown in Lewis Center. 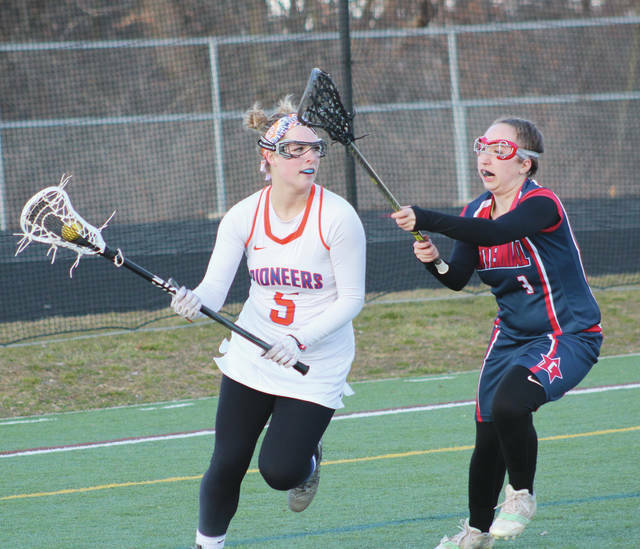 Senior Lauren Clary scored 38 seconds in and the Olentangy Orange girls lacrosse team rolled from there. The Pioneers scored early and often to the tune of nine goals in the first 10 minutes in a 19-1 win over Centennial Friday night in Lewis Center. Orange coach Megan Noone wasn’t sure what her team had in the offseason. But, through preseason practice, scrimmages and two games — games in which her team outscored the opposition 29-4 — she’s pretty excited about what the season will bring. Melanie Neuman had three goals and Tyler Bluvol, Josie Vance, Sophie Sanchez and Hannah Brown each added a pair of goals for the Pioneers (2-0). Brown scored both of her goals and assisted on a third in the first six minutes of the game. Hannah Lower led with three assists and Brown and Allie Holdcroft dished out a couple of helpers. Twelve of Orange’s goals were assisted. Tonesty Burt accounted for the lone goal by the Stars (0-1). Next up, Orange travels to Granville Tuesday night at 5:30 p.m.